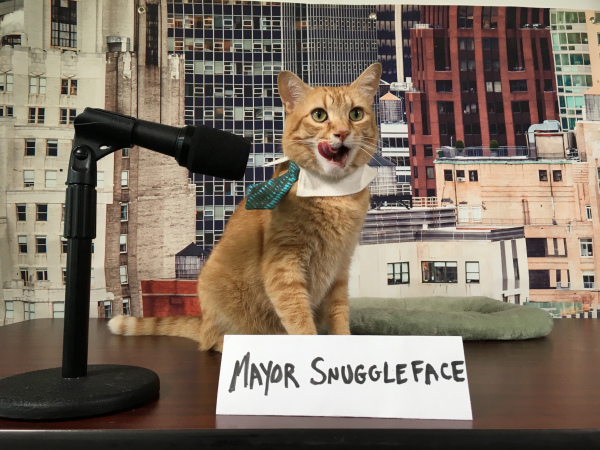 Who could resist an orange-haired Mayor with the name Snuggleface? Well, the Animal Care Centers of NYC and ASCPA are hoping no one. In fact, they took over City Hall Park on Thursday, June 29, turning it into “Kitty Hall,” in honor of Adopt-a-Shelter-Cat Month. “Kitty Hall celebrates ‘everything cats’ for adopt a cat month. We’ll have cats and kittens of all ages, sizes and colors. These kittens are spayed and neutered, fully vaccinated, tested for feline aids and leukemia, and come with tags and collars,” Jessica Vaccaro, ACC Adoption Manager , share with 1010 WINS. If you were not make it to Kitty Hall, click HERE for ACC or HERE for the ASCPA to see the animals they have looking for their forever homes. Adopters must be at least 18 years old and bring a photo ID and proof of current address. New Yorkers can also stop by to learn more about foster opportunities and other ways to volunteer.